Carson Wentz is a prototypical boom or bust quarterback prospect. He has the size, athleticism and arm strength you want, but needs significant work on his mechanics. I’d hesitate to take him in the top 5 of the draft. When the last whistle blows and a new college football champion is crowned, NFL coaches, executives and scouts turn their attention to what is derisively known as the “beauty pageant” season. Between that final game and the NFL draft, prospects are judged through a number of events that do not involve football players actually playing football: from the combine, to pro days, to individual workouts and team interviews. Prospects are measured, perform scripted plays in ideal conditions, and conduct job interviews under the same confines as speed dating. Leading up to the 2003 draft, Kyle Boller was an inaccurate quarterback with a fringe first round grade. During his pro day, Boller wowed scouts, coaches and executives with his athleticism (4.59 40 time) and by completing 96% of his passes, including a 75 yard bomb on the run. As Brian Billick acknowledged many years later, after seeing this workout and that throw, the Ravens brass convinced themselves that Boller’s inaccuracy was the result of his subpar teammates. So they traded up in the first round to draft him 19th overall, only to watch him fail to live up to the hype. Apparently throwing from your knees at midfield is not required to be a successful NFL quarterback. In 2009, Mark Sanchez was leaving dinner with Rex Ryan and Jets general manager Mike Tannenbaum following his private workout with the team. They were walking towards their cars when Sanchez hopped on a nearby motorcycle, grabbed the helmet, and said to the stunned group “All right, I’ll see you guys later.” When Sanchez laughed and revealed the bike was not his, Ryan and Tannenbaum were convinced that his willingness to pull off that prank during the biggest job interview of his life revealed that Sanchez had the “It” factor needed to lead their team. The Jets traded up to the 5th overall pick to get Sanchez; even though his tape and numbers never justified such a lofty draft status. Which brings me to Carson Wentz: I have never met him, but I watched all of his 2015 tape. I see a mid to late first round talent that needs considerable work on his mechanics and consistency. If it all pans out? He could be a stud. But that’s a big if; Wentz needs at least one year to fix his game, possibly more, and there is no guarantee that these issues can be ironed out. 1. Carson Wentz won the week. Aced his interviews. Aced his workouts. Multiple teams told me the Andrew Luck comparisons not that far off. One of the best pro days I've ever witnessed. Wentz reminds me of Joe Flacco. He had 2 55-yard passes that were as pretty as I've seen.
.@MikeMayock: I'm more convinced than ever that Carson Wentz is best QB in this year's draft.
.@MoveTheSticks on Carson Wentz's pro-day workout: These are some big-time throws he's making. I am not suggesting that I am right and these analysts are wrong; some of them have been around the NFL longer than I have been alive. But if Ozzie Newsome, one of the best general managers in NFL history, can be seduced by the allure of a kneeling 60-yard bomb during a pro day, these analysts are equally susceptible to the hype surrounding Wentz. 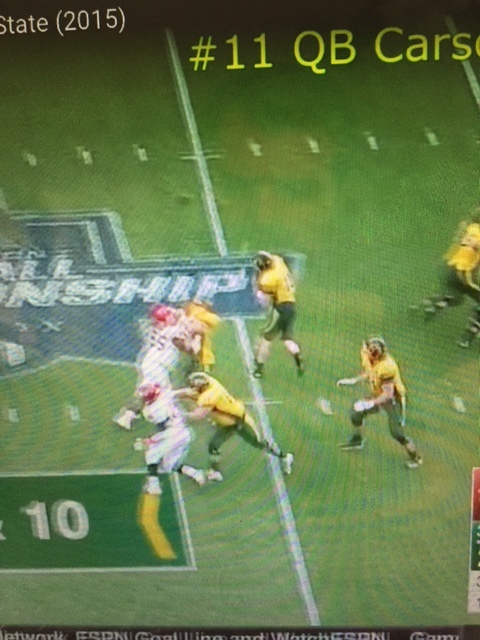 Not afraid to stand tall in the pocket and take the hit Deep ball is especially sporadic. Routinely overthrows receivers. 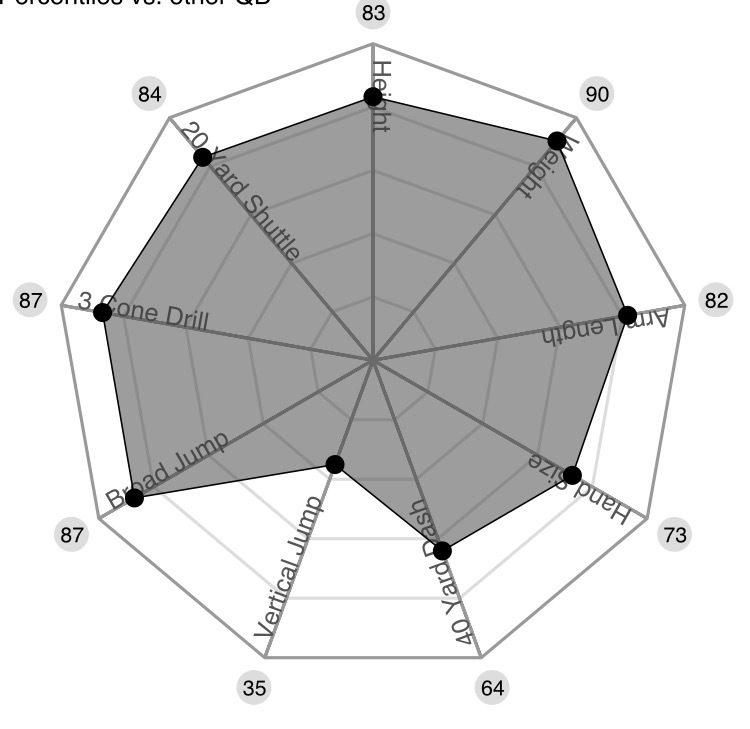 High intelligence, scoring a 40 on the wonderlic exam Tendency to lock onto his primary target; did not see many instances of Wentz working through his progressions to the second and third receiver. Wentz’s struggles on intermediate and deep throws are apparent: he completed only 53% of his passes while maintaining an impressive 8 touchdown to 1 interception ratio. While those aren’t horrible numbers by any stretch, they are not as impressive as Jared Goff’s numbers, especially on the deep ball. Whereas Goff completed 53, 75 and 48 percent of his passes on deep throws, Wentz completed only 25, 63 and 33 percent of such passes. Wentz checks all of the boxes from a size and athleticism standpoint, ranking in the top 20% of all quarterbacks in height, weight, broad jump, 3 cone drill, 20 yard shuttle, and arm length (for whatever that’s worth). But the tape is where the red flags really start to emerge. Wentz has significant issues with his passing mechanics. These issues did not hamper his production in college because he was just that much better than his competition. But in the NFL, proper mechanics are paramount. Passing windows and the margin for error shrink considerably from big time college football, let alone Division 1-AA. So while Wentz was able to skate by against the likes of Weber State and Northern Iowa, he will struggle significantly against the Seattle Seahawks or Pittsburgh Steelers trying to throw only with his arm. Here is a prime example of Wentz throwing with just his arm and neglecting any semblance of mechanical integrity with his feet, hips or legs. Here is a close up of what I am talking about; Wentz’s entire lower body is statue-esque, with no rotation towards the receiver. 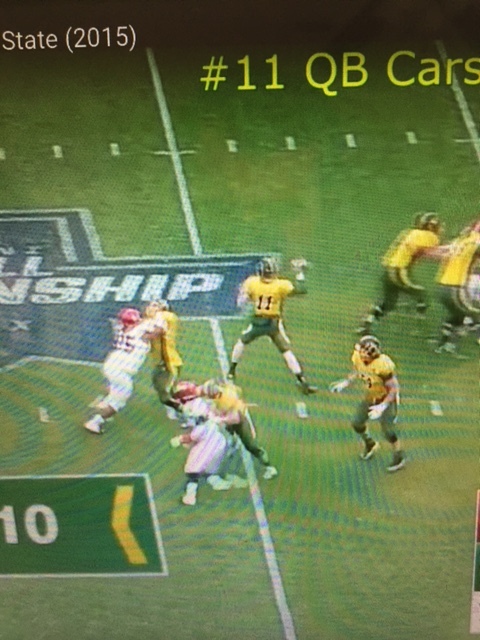 There are other times that Wentz tried to have proper mechanics but stopped short halfway through the process. Let’s break this down by still shots. Ideally, you want the legs to maintain integrity here and be shoulder-width apart. This might seem like nitpicking, but if you set up your legs too far apart, you lose accuracy and power — and at the NFL level, that makes all the difference. Wentz should have rotated through his throw, ending up with his throwing shoulder facing the receiver and his back plant leg following through in like manner. Instead, Wentz stays open to the receiver, stopping his rotation after he initially releases the football. It should come as no surprise that Wentz missed his intended receiver on this throw. These mechanical flaws should give pause for concern to any team looking to find a quarterback that can start from Day 1. They aren’t impossible to overcome, but it is going to take considerable work and time for Wentz to break free from his old habits and learn how to throw the football properly without having to think about it. 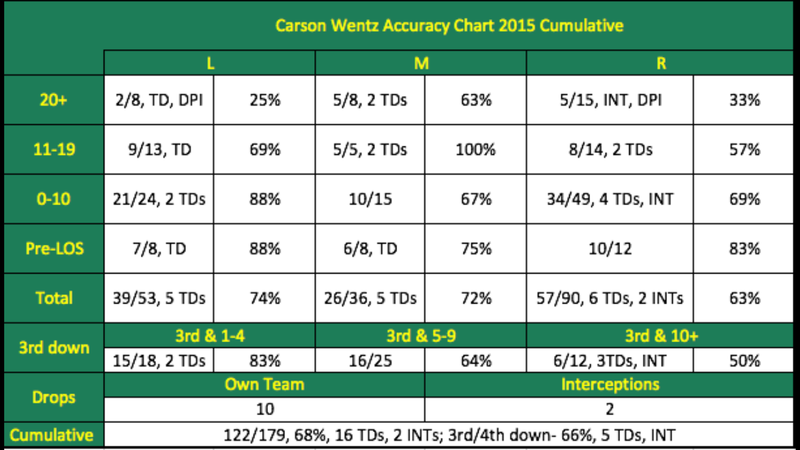 Given the issues with his mechanics, it should come as no surprise that Wentz struggles with repetitive accuracy. But the accuracy issues aren’t limited to the long ball. Wentz is not a “precision” passer — at least at a consistent enough basis — that can put the ball where only his receiver can catch it. This is an easy 10 yard out; the receiver has enough separation but Wentz throws the ball to the inside shoulder, forcing the receiver to turn back around and giving the defender an easy chance to make a play. 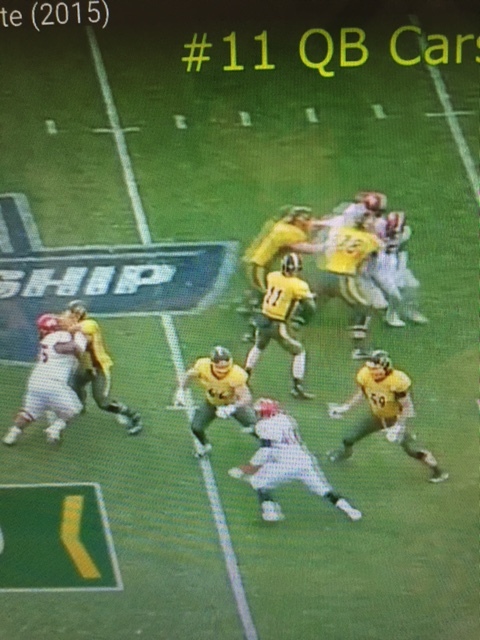 On this play, Wentz has a back breaking wide open out of the flat, but his bad ball placement forces the back to adjust and miss the opportunity for an easy score. While that might seem like nitpicking, realize that it was third down and ND State had to settle for a field goal. Precision matters, especially in the NFL, and until Wentz fixes his mechanics he will continue to have these issues. There is hope, however. There were times that Wentz was fundamentally sound and the results were very impressive. I suspect that when Wentz’s supporters project him to be a franchise quarterback, they are primarily relying on throws like this. Wentz’s mechanics were on point here, from the footwork to the rotation in his hips and shoulders. Not surprisingly, the ball placement was perfect, only his receiver didn’t hold up his end of the bargain and dropped the pass. I think you get the point, but if you want to see more examples from the tape, check these throws out: here, here, here, here and here. Wentz does better when he is forced to step up in the pocket away from pressure. That is a ridiculous pass. Compare the two prior passes: the thing that stands out the most is the direction in which Wentz is moving. On the first pass he pulls up and arms the throw; on the second throw he continues moving forward, which all but forces better mechanics: it prevents Wentz from standing still and not using his legs on the throw. More examples are here and here. Given Wentz’s size — he’s 6’6, 235 lbs — there is less concern about injury. He should be able to withstand the beating that he will take from running, although he has also shown the ability to slide when necessary. One area that I have no concern with is Wentz’s ability to handle pressure. He routinely stood tall in the pocket and delivered an accurate pass despite knowing the hit was coming. You can see another example here. If there were two areas where Goff has outperformed Wentz significantly, it’s with the deep ball pass and his ability to work through his progressions. Goff excels in both regards, Wentz is a work in progress. Watch Wentz’s head. He starts looking to his primary option on the top part of the screen, then quickly moves to the center of the field where the slot receiver was running a post. Wentz steps up into the pocket and delivers a strike for a huge gain. Again, the hype around Wentz is somewhat defensible given his ability to flash plays like this. It bears repeating that this was the exception to the norm. Wentz routinely targeted his primary option, but he at least flashed some ability to move to his second and third options. Carson Wentz is a boom or bust prospect. He has the size, athleticism, arm strength and apparent intangibles that you look for in a franchise quarterback. But he needs considerable work on his mechanics from top to bottom. These mechanical issues affect almost every part of his game, from the short to intermediate to deep throws, to throwing on the run. Until Wentz cleans these issues up, he will never reach his full potential. But if he gets drafted into a spot that allows him to sit for a year or two and clean up the finer points of his game, he could turn into a star. Bottom line, I would be hesitant to use a top 5 pick on a player with this many holes in his game. I’d consider him at 8 for the Eagles, but even then I would be hesitant. I think he should go in picks 10-15, but will likely go much higher given the dearth of quality quarterbacks in this class. Best, most balanced Wentz article I’ve read among dozens of articles. This is certainly not a puff piece, and not a shade piece either. I’ll be sure to pass this around so Eagles fans know what they’re probably getting. Appreciated! Thanks JC, I appreciate that. I think it’s important to take a balanced approach when viewing a prospect. Every prospect has flaws, and if we choose to ignore them, we do so at our own risk. That was very thorough. Thanks. Thanks Mark; appreciate the comment and your continued support.